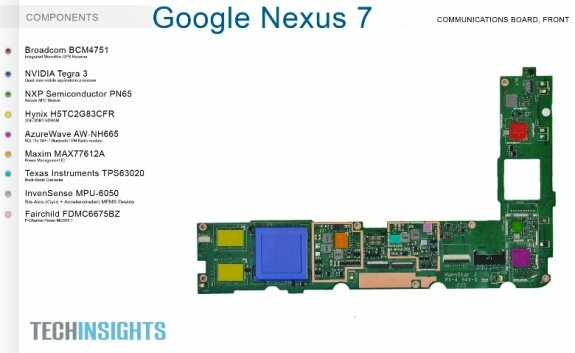 Research firm UBM TechInsights analyzed the inside of Google's Nexus 7 tablet and calculates it costs Google roughly $184 to manufacture this tablet, leaving a pretty small margin considering the retail price of the Nexus 7 is just $199. Research firm UBM TechInsights believes it is costing Google $184 to manufacture each Nexus 7, leaving a sparse $15 profit margin at the end of the day. In contrast, it is believed that Amazon makes $46 per Kindle Fire sold while Apple generates a profit of around $170 per iPad, so why would Google even bother with such a low margin product? There are a couple of compelling reasons, actually. First, if consumers shopping in this price range are buying the Nexus 7, that means money isn’t being sent directly to their competitors for their tablets. It could be as simple as that, but CNET also points out that Google is probably hoping to generate additional revenue streams based on tablet use. The majority of this revenue is likely to come from advertising, the publication says.